Recently, I have visited the most beautiful part of Himachal Pradesh i.e. Chamba District. Chamba valley is known for its scenic attractions, sparkling streams, lakes, meadows and luch deodar forests. Crowned with high mountain ranges, Its has rich in wildlife and animals like the elusive snow leopard, ibex, brown bear, and musk deer. Dalhousie is also very famous hill station of Chamba district. It spread out over five hills like Kathlog, Potreys, Tehra, Bakrota & Balun. Its named after the 19th century British Governor General Lord Dalhousie. The town’s varying altitude Shades it with a variety of vegetation that includes stately grooves of pines, deodars, oaks and flowering rhododendrons. According to Father Pervez Egbert (Who is presently look after the church) St.John’s Church at Gandhi Chowk is the oldest church in Dalhousie established in 1863. Gandhi Chowk & Subhash Chowk are destination for the local transportation. Karenalu is the major & natural water source for entire Dalhousie & surrounding areas. Tourist Information Officer Mr. Surjeet Singh Thakur (who is with Himachal Tourism for the last 22 years) presently located at Dalhousie office says that May & June are best month but tourist come regularly and in December Tourist love to see the snowfall in the valley. Hotel Mani Mahesh & Geetanjli Hotel are quite famous in the town. Mr. Anil Mehta-Secretary of Dalhousie Club says that tourist love to visit this hill station throughout the year. Dalhousie Public School, Sacred heart School, Guru Nanak public School & Hill Top School are quite famous schools of Dalhousie where local and other states children study. Panjpulla-It is nearly 2 KM away from the town where a statue of freedom fighter/social activist Sardar Ajit Singh (Real uncle of Shaheed Bhagat Singh) is located. And a water fall & boating are the major attraction for the tourist. Kalatop-It is 2440 meter above the sea level & around 8 KM away from the town and even has a good opportunity for the trekker to walk through the dense forest to reach Kalatope. According to Mr.Man Singh (who is caretaker of the Tourist Rest House at Kalatope) we have a provision for the stay here but it needs special permission from Chamba office to avail the facility. I also enjoyed the trek to Kalatope along with A grade officers of Education Department of Haryana Government. Rock Garden-Himachal Tourism tried to develop a picnic spot here but presently its not properly maintained and the spot is being used as vehicle parking. Khajjiar-It is really the most beautiful place of entire Himachal Pradesh. Its known as Mini Switzerland. It is 1960 meter above the sea level and only 22 KM away from Dalhousie by road. A picturesque spot with an emerald saucer shaped meadow amidst a dense forest which even has a lake with floating island at its center & a golf course. According to Kishan Chand Rana Operator of Zorbing Rolling ball “ we charge Rs.300 for two person for single ride in the ball in the open ground surrounded by the beautiful trees. Horse riding is quite popular among the tourists in Khajjiar. It has almost 3KM radius around the spot. It is 555 KM away from Delhi by road. Pathankot is the Nearest Railway Station & Dalhousie is 85KM away by road. I like to travel extensively whenever I found the opportunity, I am passionate about travelling, meeting Local people, culture and above all natural beauty of different parts of India. I personally several states of India yet I want to explore It meaningfully, because we Indian are lucky to have high mountains, deserts, beaches, lakes, rivers, Water falls, rich culture, historical/religious places. I am proud of my great nation. When I was only years old, I went to Vaishno Devi along with my mom, daddy and two brothers. As per my knowledge that the first trek of my life from Katra to Main Temple of Goddess Vishno Devi.At that time there were no lights and steps (proper path) but only rough trek. Every body was totally depended upon mules & horses to reach the destination but I trekked that distance on my own feet. After that During school days I was actively played Cricket but trekking was my passion. I even joined many camps with Scouts & Guides in the hills and even during college days trekked several places of Himalayan regions. In 1993 and since 1994, I again trekked several destination even along with my wife and two kids during summers. Even on 30th May,2002 my Son created a unique record while climbing Gaumukh (12,770 ft. high above the sea level) from Gangotri. It was 36 KM trek Apart from this unique record I always fond of trekking in the interior of entire Himalayan regions. 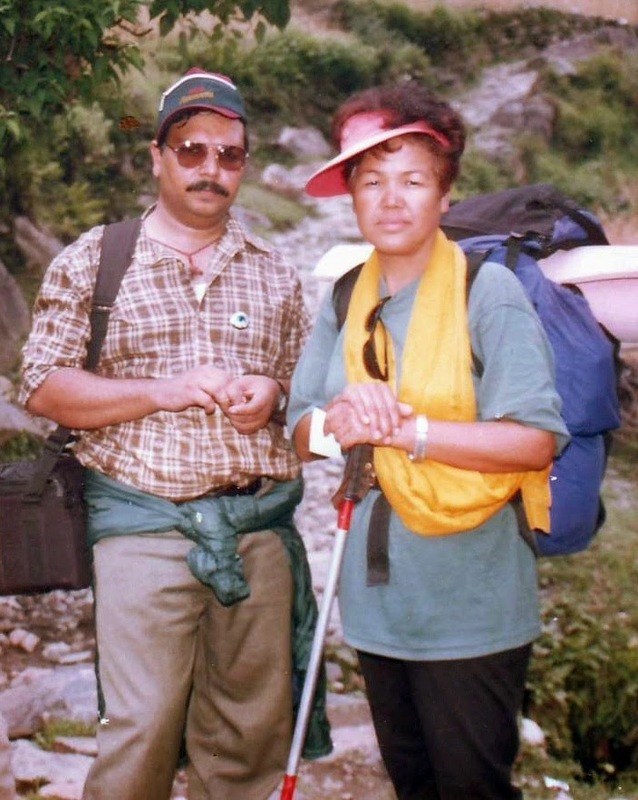 Once I even trekked with 1st Mount Everester Ms. Bachendri Pal Singh from Naugaon to Dodital, Uttarkashi, Uttarkhand I have been in touch with three times climber of Mt. Everest, Mr. Rajiv Sharma-Senior Instructor (Manali Mountaineering Institute) & Mt. Everester. I have very close friendship with Col. Ravinder Nath-(Former Director Indian Mountaineering Institute) & Col. Ashok Abbey(Former Principal of Nehru Institute of Mountaineering, Uttarkashi, Uttarkhand). Col. Ashok even invited me to cover Asia Cup Of Wall Climbing competition in which more than 12 countries participated and it was a wonderful event particularly for the Mountain lovers. I have been voluntarily associated with Indian Mountaineering Foundation(International body of Mountaineers), Climber & Explorer Club, Mystically Journey, Kailash Mansarover Sewa Samiti(R) National Adventure Sports Academy(NASA). Tshirt, Trek suit, lower, Umbrella, Torch, Mat, Water Bottle, Goggle, Cap, Camera, Mobile and of course some packed edibles also. Never carry heavy luggage otherwise you will not enjoy the trip. Before going to any trekking you should explore the destination and find the climatic condition of that particulars spot. Try to collect useful information from particular Tourism Department and even local people. When you are on a trekking you should preferably trek early in the morning but reach the desired camp before sunset. Never move fast or run to reach speedly because it makes you tired and unable to travel the long distance comfortably. As far as the distance of a day is concerned, you can trek 8-10 KM a day , even a normal trekker can do it easily. Always try to mix up yourself with the local people by way of passing smile or even you can gather local information with them. Because they are the most Useful Source of information of that particular area. Be curious, humble & friendly with them they will provide you each & every possible information/help. Monkey, deer, snake, dogs, bears, langoors, vultures, eagle are quite common with whom you may face them suddenly. So, never hurt or challenge them because they never attack you so be carefully with them but never try to beat or attack them otherwise they can harm you. Moreover, you should never move alone during trekking always move in the group from safety point of view. I think trekking & Adventure sports should be made compulsory in school and college curriculum. Because weekly trekking trip once a year makes the Students active, stout & sound health. It also brings self confidence, team building spirit, increase will power and even physical strength in the body.